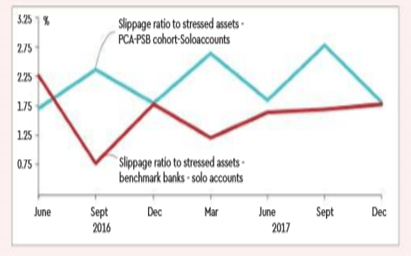 A latest report on NPAs coming under the Prompt Correct Action (PCA) reports reveals that the stressed assets are more contributed by advances through multiple banks/consortium arrangements than those contributed by individual bank advances. The report suggests that issues are observed in screening of such loan accounts. These issues are said to be of permanent in nature. PCA-PSBs with a relatively less share of M/C assets in aggregate loan portfolios also have deficiency issues with regard to the M/C assets. RBI also highlighted the irregular matching between large and small banks, which affects the latter heavily which in turn has resulted in a fruitful negotiation with other partnering consortium banks, with regard to recoveries. Also, the implementation of Insolvency and Bankruptcy Code (IBC) has provided the 11 banks under PCA an opportunity to come out of their traditional continued stressed assets shown in the books. The banks have referred 64% of the Gross NPAs as on 31st March 2018 for resolution under IBC. Against these referred amounts 52% are held as provisions. Thus, it is observed that a regulation vulnerable to withhold instincts carries related chance of risk thus, inducing behaviour by stakeholders. Based on the behaviour, it is seen that 50% of all consortium based loans are stressed. Here, the regulated entities became more dependent on exemptions resulting in institutionalisation of the entire administration of tolerance.